It's been a manic couple of weeks, but I've finally managed to get time to start doing some of the more enjoyable things with Chunk including Christmas baking! As you know he has been enjoying his special advent calendar of a book each day delivered by his two cheeky elves, and we've been reading many stories about Christmas which is helping us both get into the festive spirit. I've also got the urge to clear out lots of stuff and organise our home a bit better (probably because a new year is fast approaching and I always love the thought of it being a fresh start) so I cleared out the kitchen this week which was very therapeutic! Good kitchen storage is so important when you have a tiny kitchen like mine and for months it's just been badly organised and a mess. I managed to move all of my pots, pans, recipe books and cooking equipment into their own drawers and cupboards and I'm surprised how much clearer and bigger it looks! As soon as I finished it I actually felt like we had the space to do some messy baking (mainly because I located the Christmas cookie cutters during my declutter) so I googled a basic biscuit recipe and added some of our own ingredients so we had half a batch of plain biscuits and the other half was dark chocolate and glacier cherries. 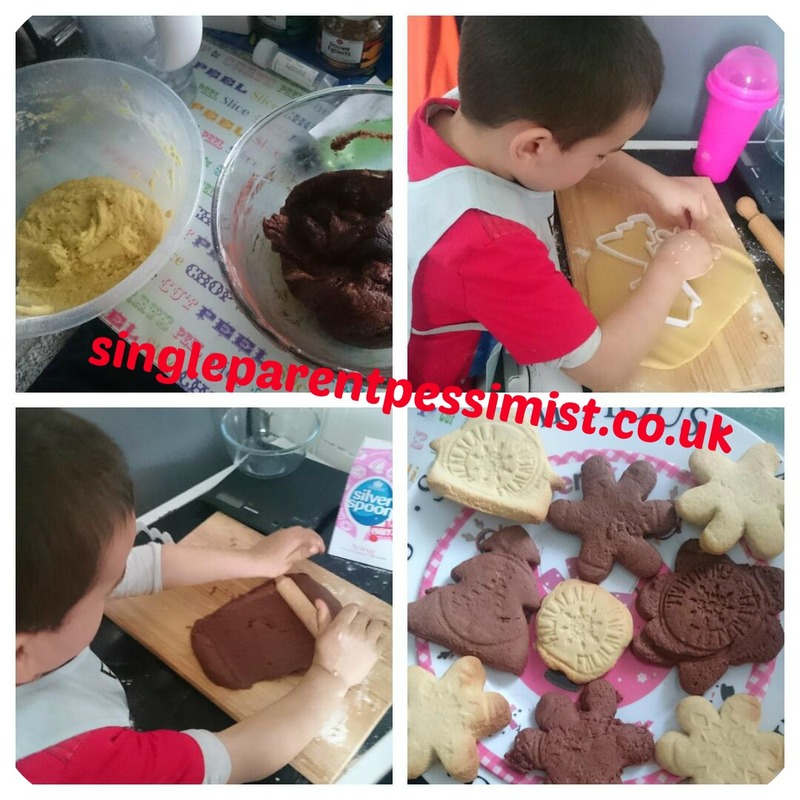 He loved mixing the ingredients and chopping up the cherries, but his favourite bit was rolling out the dough, cutting out shapes and adding some Christmas stamps on the top. The result was really good, they looked and tasted lush (especially the dark chocolate ones) so these are definitely going to be a regular event in our house on treat days! Here's the recipe which you can then add anything you want to; I'm thinking dark chocolate powder and orange zest next time! Add the vanilla, mix, then add the flour and mix well. Roll out to about 5mm. Cut into shapes.